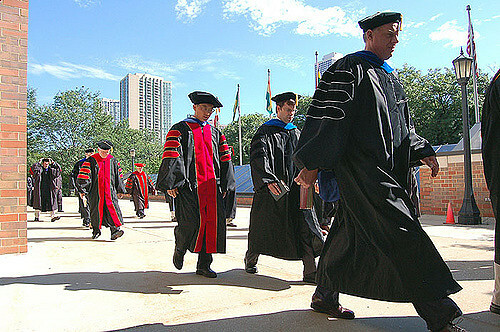 Several Bible and theology professors at the Moody Bible Institute (MBI) are openly protesting the board’s decision about a month ago to adopt the Short Statement of the Chicago Statement on Biblical Inerrancy and to require all faculty to sign it. The professors, who all served on an ad-hoc committee on inerrancy, voiced their opposition in four documents recently sent to the entire MBI faculty via the administrative assistant of Associate Provost Larry Davidhizar. The professors are upset because they believe the Moody Doctrinal Statement is sufficient and that the board’s new requirement confirms allegations that some faculty do not affirm biblical inerrancy. “If (trustees) make us sign (the Chicago Statement), we are concerned that it will communicate to the faculty and the public that you believe there is a problem,” wrote Bible/Theology Division Chairman Steven Sanchez. Similarly, Theology Professor Michael McDuffee complained that the trustees listened to allegations of theological drift brought by “certain faculty members – number unknown” and the advice of “outside power brokers” (identified in a separate document as President of The Southern Baptist Theological Seminary Albert Mohler, Pastor Emeritus of The Moody Church Erwin Lutzer, and former MBI Provost Charlie Dyer). Instead, McDuffee said the board should have listened to the faculty inerrancy committee, which concluded that all members of the Bible/Theology Division sufficiently affirm inerrancy. Does MBI Have an Inerrancy Problem? According to Weber, Drs. David Rim and Ashish Varma said they reject what’s known as a “correspondence view of truth” – the basic notion that truth corresponds with reality. They also reportedly said they reject the Chicago Statement’s view of inerrancy, which Weber said he had always understood to be the view affirmed in all MBI theology classes. McDuffee also accused me of waging a “smear campaign” against the two professors and chastised me for failing to ask Dr. Rim the “concise and unambiguous question” – “Do you affirm inerrancy as defined by the 1978 Chicago Statement on Biblical Inerrancy?” – thus clearing up any confusion about his stance. However, in an email to Rim on January 5, I wrote, “Is it true you do not affirm inerrancy as described in the Chicago Statement on Inerrancy?” Rim responded that he affirms the Moody Doctrinal Statement, to which I replied: “You didn’t answer my question, though. Do you affirm inerrancy as described by the Chicago Statement?” Rim never responded to my follow-up question, and Varma has not responded to any of my emails seeking clarification. The documents do not explain what caused this apparent about-face by both professors. However, they do make two remarkable assertions. One, they argue that a correspondence view of truth is not necessary to affirm inerrancy. A mere “pre-theoretical claim about language and ‘correspondence,’” will do. And two, they assert that adhering to a correspondence view is not required to sign the Chicago Statement, essentially rendering the board’s new requirement ineffectual. Is a “correspondence view” necessary for inerrancy? According to leading evangelical apologist, Dr. John Warwick Montgomery, a correspondence view “simply means that what one says fits the reality of the world.” So, if the Bible describes a historical event or detail, those who adhere to a correspondence view believe the event or detail is real. However, some who reject a correspondence view, like evangelical scholar Peter Enns, deny the historicity of some biblical narratives. Enns argues that one could affirm a certain “truth” expressed in the story of the collapse of Jericho’s wall, for example, while simultaneously denying the “real” existence of a wall. Similarly, postmodern scholar Myron Penner argues that no human statements, even those in Scripture, are absolutely true because they’re expressed in human language, which is inherently flawed. During the division meeting, Varma presented an article by Penner, and according to Weber, both Varma and Rim affirmed Penner’s view. It’s not surprising, then, that some professors expressed concern about their colleagues’ view. Yet McDuffee argues in his paper that though Rim and Varma reject a “philosophical correspondence view or theory of truth,” they still qualify as biblical inerrantists because they embrace the “common usage” of correspondence reportedly espoused by Kevin Vanhoozer, Research Professor of Systematic Theology at Trinity Evangelical Divinity School. What’s required to sign Chicago Statement? The documents authored by Sanchez, Quiggle, and McDuffee all assert that signing the Chicago Statement does not require adherence to a correspondence view either. McDuffee bases this view on the fact that the Chicago Statement “does not include any mention of a correspondence view of truth.” In addition, he notes that commentaries written by some of the creators of the Chicago Statement, asserting that correspondence view is required, were written years after the statement was initially signed. Therefore, they may not have represented the consensus view. Soon after Moody adopted the Short Statement of the Chicago Statement, I interviewed Dr. Norm Geisler, an original framer of the Chicago Statement. He said he was happy with the board’s action, but feared that by adopting the short statement, as opposed to the full Chicago Statement, the board left some wiggle room for those who want to deny correspondence view. I can’t speak to the professors’ motives, nor can I, given such limited information know for sure what Rim and Varma mean by their denial of correspondence view. But clearly, the Chicago Statement was created, clarified, and re-clarified repeatedly to prevent professors from doing precisely what the MBI inerrancy committee is doing. Signing the Chicago Statement does require correspondence view. And though the statement may mean nothing to McDuffee and some of his colleagues, it meant a great deal to the original framers and signers of the statement – and presumably to the Moody board, as well. The signers and framers saw the danger of stripping words of their apparent meaning and denying the reality of certain parts of Scripture. Though clearly not everything in Scripture is meant to be taken literally, certainly those parts that are historical must be interpreted as historical. And once theologians begin allowing error in any part of Scripture, it’s just a matter of time until they allow error in all of it. The documents distributed by the inerrancy committee pervert the meaning and intent of the Chicago Statement and present a deceptive argument for anyone who wishes to do likewise. Contrary to these committee members’ assertions, they have not shown that there’s no inerrancy problem at Moody, but the exact opposite. I understand professors’ desire to defend their colleagues. And perhaps there are good arguments supporting Rim’s and Varma’s view, which have not yet been expressed. But as Montgomery told me, “sympathy for the dissident” is “exactly how Princeton Theological Seminary went down the drain.” Professors and administrators must keep in mind that there is something far greater than men’s reputations at stake. This is about upholding inerrancy and protecting the future of Moody. Given the inerrancy committee’s response, it’s clear that the board needs to affirm the original intent of the Chicago Statement and explicitly require a correspondence view. I pray the board will do so when it meets next Thursday and Friday. *An earlier version did not include the first part of this sentence, which was added to provide clarity on Professor McDuffee’s position. They did…but Christianity itself is bigger than what a few men on a Bible college board decided on the matter, or a few hundred who signed the Chicago statement. Your discussion has led many to wonder, regardless of what MBI’s board decided, how to come to a conclusion themselves. In that way, you only presented one side of the debate to these people who hold to inerrancy but wonder, for example, why the Chicago statement is necessary. It seems like the Chicago statement is referred to more than the Bible itself in the discussion. I agree. Christianity is much bigger than Moody or evangelicalism, for that matter. But again, my articles have dealt with how Moody defines inerrancy, not all of the Christian church. That being said, I have reached out to some theologians about doing a podcast on the topic with leaders on both sides of the issue. We’ll see what comes of that. I’m certainly open to honest theological debate about correspondence and inerrancy. The key issue is the definition of “inerrancy”. The Chicago Statement defines it from a traditional & conservative perspective. This has been the position I had always presumed Moody held. There are others who claim to be “inerrantists”, but it doesn’t take long to realize they use the word in a much looser fashion. I had one of the above listed evangelical profs for a course I took many years ago. Something was amiss. But I could never put my finger on it. It was slippery. Something about this approach to the Scriptures was different. I felt like I was in a literature, not a Bible class. In all of this, it was as though the reverence for the Book had been lost. And it cast doubts on holy writ. It loosened faith; didn’t solidify it. At least that was my experience. Moody is Bible – traditionally so. Discern who is on side (via the expanded Chicago Statement). Reset the stake. Wish those who want to debate the definition well, but Moody is not the school for them. Anything short of this, and I’m afraid for its future. Stakeholders are of the traditional sort. I know there were those associated with MBI who signed the statement in 1978, but was there any reason why the school itself did not sign on until 40 years later? (This is a serious question; I’m trying to figure this out). The impression I get from those where were professors then was that no one foresaw a need to do that. Moody’s doctrinal statement seemed sufficient and no one anticipated that there would be professors at Moody some day who would deny correspondence theory. Moody Alum here. I don’t know why its such a controversy to enforce a standard of doctrinal belief. If you have a liberal professor then let them go. There are lots of other professors who are in agreement to the inerrancy of scripture looking for a job. I know that while i was in school there were a lot of profs who dint have the correspondence view. They didn’t believe in a world wide floor or literal 6 day creation. They probably fear that a lot of professors will be let go for not believing in those things. You are absolutely right. Either the story is true or not. In the real world people need the Bible to be true. Stay in the realm of academia and you will never be able to help the drug addict get clean, the depress get healed, or the shaman become a pastor. In order to see lives radically changed you need to have a solid belief that the word of God is true. It comes down to “Do you believe the Bible” not “I believe the Bible is good for people”. That’s what we have in evangelical academia today. Professors who believe the Bible is good for people not that the bible is true. I loved Mcduffee and at the time he headed the outreach ministry although he never went out on the street. Get street preaching and witnessing and you can’t have thoughts like believe in Jesus but the creation story is false or believe in Jesus but his ascension was metaphorical. I think the core problem was taking in the federal money now MBI is subject to all the trash that all other secular colleges are affected by. They better turn down the federal money before the next lawsuit opens up the door to LGBTQ+ faculty and students rights. DL Moody wanted the Chicago bible school to be unaccredited for a reason. He saw the problems that major universities had. The liberalism at the turn of the 19th century. The hierarchy of the clergy vs congregation. MBI changed to meet the churches expectations of M. Div’s. PHDs, and B.A. Pastoral degrees. Now the church is getting what it did not expect. A lot of liberally theologically influenced leadership. The common man is still wondering why can’t you just believe the Bible is true.